Will Franco-Nevada Raise Its Dividend in 2017? Investors hope rising prospects for commodity markets could help bring a bigger payday from the royalty and streaming specialist this year. Mining is a tough business, but Franco-Nevada (NYSE:FNV) has found a way to avoid many of the hassles ordinary mining companies face. As a Canadian royalty and streaming company, Franco-Nevada has plenty of exposure to the price of gold and other precious metals, but it also limits its risks with respect to potential problems that operating mining companies deal with every day. The streaming specialist is able to take the free cash flow it generates from its financing operations and use some of it to pay dividends to its shareholders, and over time, those payments have grown. As the new year begins, investors want to know if the company can give them even higher dividends. Let's look more closely to see whether Franco-Nevada will follow through with a dividend hike in 2017. Franco-Nevada paid its first dividend in 2008, when it was listed only on Canadian stock exchanges, but it continued to make payouts once it made its way onto the New York Stock Exchange in 2011. Over that time, it has consistently boosted its payouts from year to year. That might not sound like a big deal, but in a gold market that has seen huge amounts of volatility during that period, the stability of Franco-Nevada's dividend history is remarkable. One interesting thing about Franco-Nevada is that it has changed the timing of its distributions on a couple of occasions. Early on, the streaming company made semiannual dividend payments, but in 2010, it made the decision to switch to monthly payouts. At the time, Franco-Nevada's chairman said the company was "very proud to be joining Goldcorp, the only other gold company doing monthly dividends in Canada, and it's a tradition that we hope we're going to maintain for a long time to come." In 2014, though, Franco-Nevada moved to quarterly dividends. Nevertheless, the move resulted in a net increase in payments, which was particularly extraordinary in light of gold's decline from $1,800 per ounce in late 2012 to $1,200 per ounce near the beginning of 2014. FNV Dividend data by YCharts. Note: Abrupt moves on chart reflect change in dividend frequency. Even more remarkable is Franco-Nevada's attitude toward dividends. In 2014, CEO David Harquail gave a summary of the company's dividend philosophy, saying, "We like to set it at a level that we think we'll never have to cut it." In doing new streaming and royalty deals, Franco-Nevada has been careful to ensure that they will be accretive enough to justify further increases. I'd say future dividend increases are going to be dependent on us booking more and more assets to be able to justify those dividend increases. ... The last thing you should be doing is cutting your dividend when gold prices go down, because that's when investors need even more support for your share price. That's where Franco-Nevada has distinguished itself, and that trait is very attractive to dividend investors. Most recently, Franco-Nevada has seen record results, largely because of its early 2016 acquisition of a precious metals stream from Glencore. In November, the company's third-quarter financial report included new highs in revenue, production, and adjusted pre-tax operating earnings. That led Franco-Nevada to boost its guidance for the full year, and acquisitions of oil and gas royalty assets in the U.S. could pay off even more if the recent rise in energy prices holds. 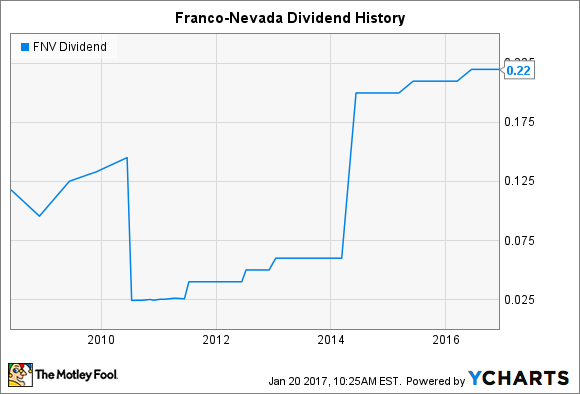 Looking forward, Franco-Nevada will likely be conservative with any dividend increase, but it takes pride in its dividend history. Investors should expect another modest $0.01 per share rise to $0.23 per share, with the timing likely coming in the middle of the year. Barring unforeseen problems, Franco-Nevada is staying on course to be a standout stock for dividend investors in the precious metals industry.